My third artifact is another one of my reflections, but this time it is from the online collaboration week of class. The reason I choose this is that I have never had to collaborate with anyone for a project solely online. I know that in the world we live in that I will have to do it again in the future whether it be for school or a job, and I believe this experience was an important one for me to have. This week’s content has been very eye-opening for me for several reasons. While I have had online classes before I have never had to collaborate with my peers like this before. It has been challenging for a few reasons, but it has also been really fun. I think that one of the main issues that I have had is making sure that everyone has time to get to meet up, and also getting back to group members it in a timely manner. I’m sure that everyone is very busy, which is part of the reason we are taking online classes, but when working in group decisions can’t be made until every group member has said their thoughts. Where the problem comes up is when a group member is caught up in business and they cannot correspond as quickly this leads to the group having to wait to make decisions and makes the project last a lot longer. Unfortunately, when in this position there is not much you can do but wait till the member is available. There is, however, precautions that all member of the group can take to make sure that the work gets done before the due date. According to Richardson(2004), we should “waste no time communicating with your group”, and I think that this is detrimental to the success of the collaboration because if you communicate as soon as possible there is a less of a chance of falling behind because of a busy schedule. This is what my group did and we were able to complete everything we needed in a timely manner. Also, to have made this easier we could have used an easier form of communication like text or GroupMe so that messages would be instant, and responding would be much quicker. I think that the next time I have to do an online collaboration I will definitely use one of these easier forms of communication. Richardson, Carole. (2004). Participating in Group Projects Online. In G. M. Piskurich (Ed. ), Getting the most from online learning: A learner’s guide (pp. 145-152). San Francisco: John Wiley & Sons. The second artifact that I wanted to share was a technology that I will continue to use for a very long time. It has helped me keep up of my tasks for the week so that I am always on track. 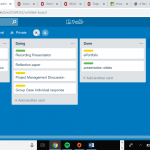 This technology is called Trello and it is basically an online to-do list. It lets you log what you have to do, what you’re doing, and what you have done into color-coded categories that help to make sure you stay on top of everything you have to do. I really love how customizable it is because I can do what works for me. It has really helped me in this course as well as this semester. For my first artifact, I wanted to share my reflection from the time & task management week because I feel as though managing time is something we all deal with the things I learned this week will be tips that I will apply in my professional life for a long time. Leach, A. (n.d.). Time Management Tips for Non-Traditional Students. Retrieved June 26, 2017, from http://spsblog.cofc.edu/blog/6-time-management-tips-for-non-traditional-students (Links to an external site. )Links to an external site.. When thinking back to the first week of class I can say that the reading where they said online classes have just much (if not more) work than regular ones, was completely true. Group work is always difficult especially when trying to find a balance between doing too much and doing too little. With my group though I feel I was able to find that balance despite my busy schedule. In one of this weeks learning, we learned about procrastination and why people do it. I have to say that I identified with several of the reasons and I’m better for realizing that my excuses are just that, excuses.